Christmas Cowboy Style with some classics as well as some new originals. Brother, Greg's new cowboy version A Cowboy's Night Before Christmas is a family pleaser for all ages. Hope you enjoy ! 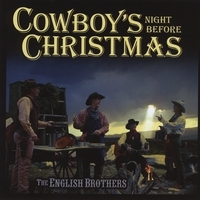 This is a fun Cowboy Christmas CD with the flavor of the West and four cowboys singing around the fire. The English Brothers smooth harmony blend and added yodeling make for a great Christmas package.